A new umbrella organisation for fleet and mobility management has launched to represent the interests of fleet and mobility managers on a European level. 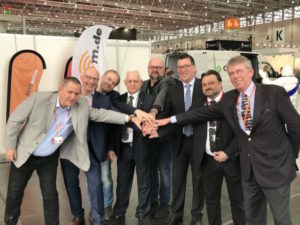 (L-R) Markus Weidmann, Ralf Käser,and Anton Wyssen of SFFV; Bernd Kull- mann, Axel Schäefer and Marc-Oliver Prinzing of BVF; Michael Närr and Henning Heise of FVA. The European Fleet and Mobility Association (EUFMA) has been founded by the Bundesverband Fuhrparkmanagement (BVF), Schweizerischer Fahrzeugflottenbesitzer – Verband (SFFV) and Fuhrparkverbandes Austria (FVA) associations in Germany, Switzerland and Austria, with other national fleet associations invited to join. The idea is to create a European network that can enable operators with planning fleet and mobility requirements across national borders, taking country-specific features into account. The associations will start planning for organisational and process work in the coming weeks. “It is above all important that we give the positions of the member companies of all affiliated associations a stronger, concentrated voice,” said Ralf Käser, board member of the SFFV.